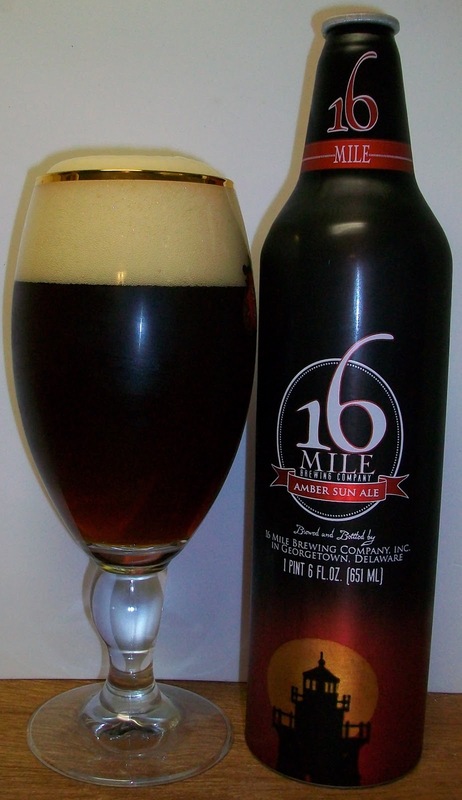 16 Mile Brewing Company, Inc.
Amber Sun Ale– Roasty finishing malts, balanced with just enough bitterness provides a traditional amber ale that is dark red to the eye, but not heavy on the palate. 16 Mile names this premium amber ale for the famous sunsets found at the Breakwater Lighthouse located off of Lewes Beach, Delaware. 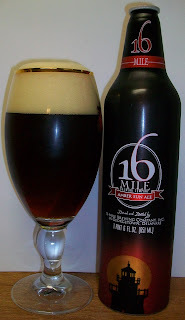 I received a bottle of 16 Mile from by friend Gene as a gift then I went to State Line Liquors and purchased the other two. I’ve heard good things about these beers but I have never had them before. So I’m really looking forward to tasting these unusual bottle shaped cans of beer. The beer pours a dark amber with ruby hues and a fairly rich tan head. The nose is pleasant with sweet caramel malt aromas and floral hops. Not a bad first sip; sweet caramel malt flavors and a slight hop bite but there is also something odd on the finish. The experience starts out with a malt sweetness up front followed by a tingling effervescence over the tongue in the middle of the sip. The back end is fairly easy drinking but there is an extreme harshness that develops during the swallow. The finish has some very nice caramel almost toasted malt flavors but this is masked by a harsh off flavor that is not appealing at all. It’s hard to comment about the final aftertaste because by that time there is a chill that comes over me after I take a breath. Each sip gets increasingly harder to swallow and now the finish is almost unbearable. We are only at 62 degrees and this may be another 16 Mile that I will not finish. If this was only a 12 oz bottle I would have easily finished it. But this 22 oz bottle/can is too much for me. I’m just not going to torture myself any further. I’m not sure this is bad enough for an F it was quite drinkable during the first few sips. However this needs to be ice cold in order to enjoy it and I don’t keep any of my beers ice cold. This is certainly a D- at best. It is possible that this was a bad or faulty bottle/can. I feel I need to review this again if the brewery starts bottling in glass bottles.